June: The silly season begins in earnest. Google and Microsoft buy some companies you’ve never heard of. Novell is acquired. 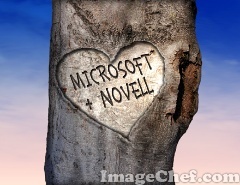 As we wrote last week, it is possible for Microsoft to acquire Novell, but this might not be the best strategy. The agreement means that Microsoft can run their virtualised applications on our environment and we can run ours on theirs. I think it works really well. Our core assumption is that customers are Microsoft customers and have multiple Java technology stacks. So in a virtualized environment, this relationship allows us to support and optimise those workloads. This puts us in a stronger position than competitors such as Red Hat for example. So our strategy is built on that assumption of heterogeneity. Where firms have multiple technology stacks, we can optimise and build security and governance into them.